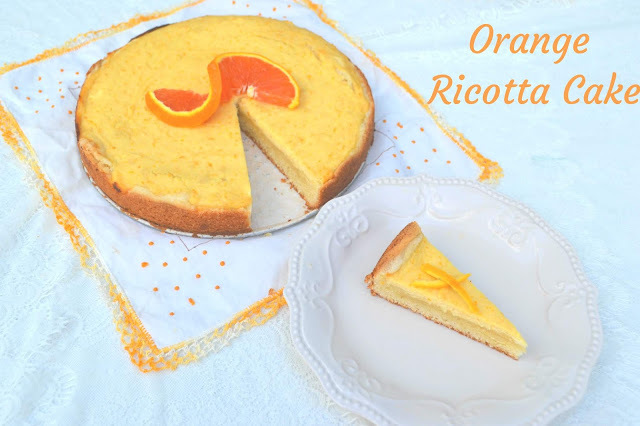 Orange Ricotta Cake is not quite a cheesecake. is a lovely, not too sweet almond cake baked with ricotta,as well as a kiss of honey and orange zest. It is a lovely, light cake and is best made a day or two before serving to give the citrus flavors time to bloom within the cake. I got this recipe from my local newspaper, a year ago, when they featured it for an Easter dinner collection of recipes in the food section. I instantly knew that one was a keeper! Sponsor Shout out! Dixie Crystals Sugar supplied me with sugar to help me in the creation of recipes for sweets week! It is being showcased in this recipe! A lovely, not too sweet almond cake baked with ricotta,as well as a kiss of honey and orange zest. It is a lovely, light cake and is best made a day or two before serving to give the citrus flavors time to bloom within the cake. Heat oven to 375 degrees. Liberally grease a spring form pan with a cooking spray. In a small bowl combine ricotta, honey, and orange zest. Set aside. In a large bowl, beat butter with 1 cup sugar until light and fluffy, add eggs one at a time blending well. Add in almond extract. With the mixer running on low, add in flour, baking powder, and salt. mix just until combined- do not over mix. Using a spoon, drop dollops of the ricotta mixture on top of the cake batter. Push gently into the cake batter with the back of the spoon. Sprinkle with remaining 1 1/2 Tablespoons of sugar. Bake for 30-35 minutes or until the cake edges are lightly browned and the middle is set. The ricotta mixture may look slightly wet- it'll set further as it cools. Cool slightly before releasing it from pan. Top with powdered sugar before serving, if desired. Now here is more #SpringSweetsWeek Recipes! and don't forget to check out the prize package and enter the giveaway below! I can see why you immediately grabbed this recipe and hung onto it. Perfect Spring dessert. I love how it has those yummy layers. Orange treats always make me think of my dad, so I can't wait to try this! This cake sounds absolutely delightful! I love ricotta desserts - they are so light and delicious! This just screams spring! So yum! Yum! What a great way to brighten up a cake with the orange flavor. Man that sounds good. I love using ricotta in desserts and the orange just makes me swoon. I have yet to make a ricotta cake. This one looks so moist and delicious. Definitely going to try making this one. I love citrus desserts in the spring, and this looks delicious! I just can't get over how pretty the color of this cake is! I can't wait to try it!